Ask any chef and they’ll tell you that a good set of knives is the cornerstone of any kitchen – commercial or home. The right knives can cut prep time in half and help you achieve special cuts with ease. When it comes to knife brands, Wusthof is the king of the castle. 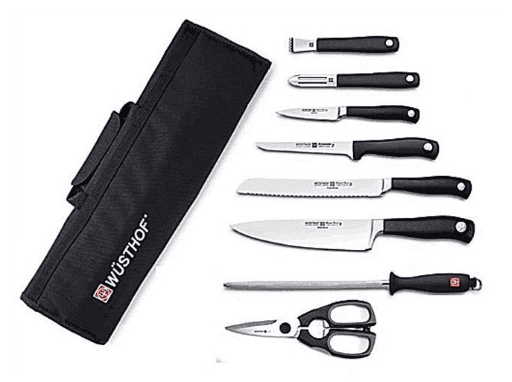 Founded in Germany more than 200 years ago, Wusthof knives can be found in kitchens of world-renowned chefs. Even today, their knives are expertly crafted in its founding city: Solingen, the city of blades. Precision edge technology is what sets Wusthof’s Grand Prix II knives apart from the competition. Each blade is laser-measured, and computers calculate the precise angle needed to sharpen the blade. Every blade is then sharpened on a whetstone by a precision robot, and polished using a special disc. While Wusthof has a number of different knife lines, the Classic and Grand Prix II are the most popular. At first glance, you may think the two are from the same line-up. But there are subtle differences between the Classic and Grand Prix that affect the feel, balance and performance of these knives. The primary difference between the Classic and Grand Prix II knives is the handle. The Grand Prix II handle is ergonomically designed for a more natural feel and balance, whereas the Classic handle features a fully exposed tang and triple-riveted design. While it may seem insignificant, these little differences in the handle design make a world of difference in the feel and performance of each knife. Take, for example, the Grand Prix chef knife. The handle on this knife is balanced and comfortable to hold. It feels good in your hand, so it’s a pleasure to use. By comparison, the Classic chef knife is still well-balanced, but the rivets and exposed tang make handling a little less comfortable for some people. The Grand Prix II Chef Knife. Great quality and design. I’ve had the pleasure of using both of these knives, and they both exceeded my expectations. But the Grand Prix II just felt more natural and balanced whenever I used it. Aside from the differences in the handle, these two knife lines are virtually the same. Both have blades made of high-carbon steel, both have a Rockwell hardness level of 58, and both feature a PEtec Edge. Comes with my favorite Wusthof block. The Grand Prix II Cutlery Set features four knives and a handsome knife block that looks great in any kitchen. This is a set I always recommend for people who want a basic set of knives to get their collection started. As you can see, this collection comes with all of the basic knives you’ll need to handle most cutting tasks in the kitchen. The chef’s knife is a good length. In fact, 8” is my preferred length. Larger chef knives can be bulky and difficult to use, although they do have their purpose. While not used quite as often, the utility knife can come in handy when making sandwiches, cutting cheese or scoring onions for mincing. The classic paring knife is on the small side, but feels balanced and comfortable to use. I have no problems peeling potatoes and apples with this knife. And the incredibly sharp edge holds up well even after years of use. 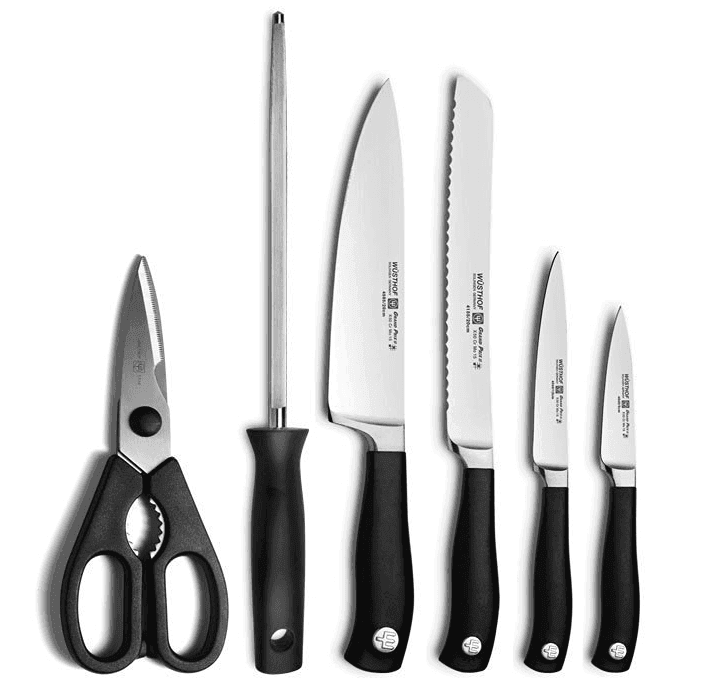 Along with these basic knives, you also receive a sharpening steel, a knife block and a pair of kitchen shears. These are accessories you’d expect to get with any knife set, and you’ll find yourself reaching for the kitchen shears more often than you’d imagine. I love the pebble-grain texture of the handles because they give these knives a really great grip. None of these knives have ever felt slippery in my hands, and I’ve yet to lose by grip on any one of them. The ergonomic design of the handle also makes it a pleasure to use these knives. Even after a long prep session, my hands are never aching or in pain. 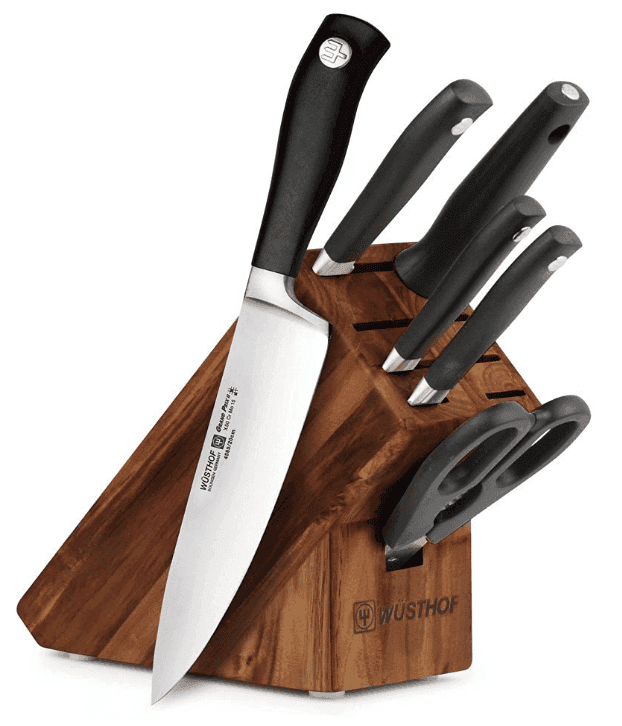 Of course, like other Wusthof knives, the blade is made of high-carbon steel, which is rust-resistant. And the Acacia knife block that comes with this set adds a touch of elegance to any kitchen. If you’re just starting your knife collection, I highly recommend 7-Piece Cutlery Set. A complete Grand Prix set. There’s all you need inside. If you don’t care much about having a knife block and you want a bigger collection, the 9-piece set is the ideal choice. The Trident is another one of my favorites because it comes with more than just a basic set of knives. There’s a lot of versatility with this set, which is why it’s one of my absolute favorite sets in the Grand Prix II line. I tend to recommend this set for people who don’t really care about having a knife block and need a little more variety. With this collection of knives, you can tackle virtually any task in the kitchen. The boning knife to debone meats and fish. The bread knife to cut bread (and tomatoes on occasion). The lemon zester to zest lemons and add tremendous flavor to your food. The paring knife to peel fruits and vegetables, or for patterns and scoring. The potato peeler to – you guessed it – peel potatoes (and other vegetables). The chef’s knife to slice, dice, cut and chop. I really love the feel and the balance of these knives as well. The handle is comfortable in your hands, and the pebble texture helps prevent slips. Even when I use the peeler for potatoes, which is a job where your hands tend to get wet and slippery, I’ve never lost my grip. The carrying case is a nice addition, and keeps your knives organized. If you’re a cooking school student, I highly recommend this set because the case makes it easy to bring these knives with you to class. I’ve been using these knives in my home kitchen for a long time, and they’ve maintained their edge nicely. The sharpening steel helps, but the quality and precision Wusthof puts into making these knives is really the reason why they stay sharp for so long. I’m no stranger to the Wusthof brand – their knives have been in my family’s kitchen for years. But the Grand Prix II line is special because the sets are affordable and offer a good collection of knives everyday cooks would use. Both of these sets are excellent in their own right, and the right one for you will really be dependent on your needs. If you’re just getting started and you want something basic, the 7-piece collection is ideal. But for those who want a little bit more versatility, I highly recommend the 9-piece collection.